I finally watched Disney/Pixar's Inside Out, and I agree with the consensus opinion that Pixar has done it again, making a movie that's both fun and poignant, with a narrative that young children can understand while containing deeper messages for adults. Read on for more of my thoughts, but be aware that MAJOR SPOILERS FOLLOW, since it is hard to discuss my thoughts as a child psychiatrist on the movie's depiction of emotions without going into the details. 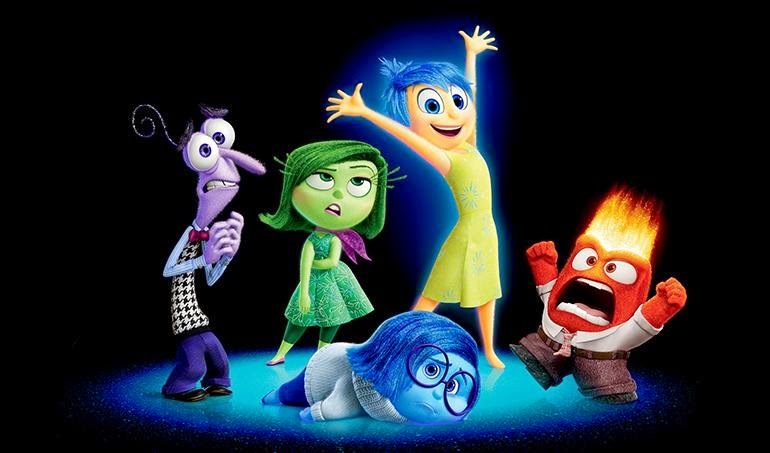 The main characters: Fear, Disgust, Joy, Anger, and (sigh) Sadness. The plot of Inside Out is fairly straightforward: a preteen girl named Riley moves with her parents from Minnesota to San Francisco, and she experiences a crisis in her emotional state, in her relationship with her parents, and in her concept of herself. Most of the action takes place inside Riley's head, where 5 different emotions (Joy, Sadness, Anger, Disgust, and Fear) take turns at the control center of the brain's headquarters, directing Riley's actions depending on which emotion is at the controls. Joy is the energetic (cheer)leader who attempts to remain in control as much as possible, especially over Sadness. The crux of the movie is about Joy going on a journey in which she (and everyone else) learns to value Sadness. The movie demonstrates the inner workings of memory in a visually coherent and fairly accurate way. I especially like how Riley's incoming memories, which look like softball-sized glowing orbs, are temporarily kept at headquarters until Riley sleeps, at which point they are sent into long term memory. They also find a way to neatly show core aspects of Riley's identity/personality as floating islands that serve as repositories of concepts such as Family, Honesty, and Goofiness. The depiction of the weight of parental expectations is very well-done. When Riley becomes upset after the move, her parents say to her: "Where's my happy girl? ", clearly indicating their preference for how she should feel. This is one way that parents insidiously and inadvertently tell their children it's not OK to be sad, and the fact that (if I recall correctly) each parent says this to Riley on separate occasions shows that Pixar is emphasizing the harm that this sort of communication can do. A critical scene that works incredibly well both as a turning point in the plot and a learning opportunity is when Sadness convinces a character to do something that Joy could not, simply by listening and showing empathy for that character's feelings. This teaches Joy (and us) the importance of validating another person's emotions. Some of my favorite moments in the movie are when it delves into the minds of characters other than Riley. I really enjoyed how each character has a different predominant emotion, and the emotions work together in different ways depending on the individual. For example, inside the head of Riley's mother, the different emotions sit around like a committee with Sadness presiding, while a teen boy's mind is dominated by fear, with all his emotions running amok. When Riley and her father get into an argument during dinner, the camera dives into each person's mind and clearly shows how Anger in one person leads to escalating Anger in the other, in a mutually assured destruction kind of way. This is a good example of an amygdala hijack, which comes up frequently when I discuss family conflict with patients. Despite being a primary emotion, each of the emotion characters are capable of expressing other emotions. This helps make them more interesting and less one-dimensional; it also helps subtly reinforce the point that having one emotion dominate all the time may not be desirable. Initially, each of Riley's memories passing through the control center is a distinct color, corresponding to the emotion associated with the memory. By the end of the movie, memories have become multi-hued, nicely illustrating Riley reaching a developmental stage where she is capable of more emotional nuance. A scary clown is locked away in Riley's subconscious, visually depicted as a vault in a deep cavern. I'm not sure if even the psychoanalysts still use the term "subconscious," yet it persists in the popular culture, perhaps because it's so easy to conjure up that visual image of something deeply buried. Memories, of course, are not accurate recordings preserved in amber, but are malleable and often unreliable. While it would have been nice for the movie to show this, I understand that it would probably overcomplicate things. Similarly, expanding beyond just the 5 emotions featured would have been nice but too complicated. Though dramatic, I do not feel that the scene of Riley taking a credit card from her mother's wallet and getting on a bus back to Minnesota is very believable. Given her generally good relationship with her parents in the past, it would take much more than a couple of arguments to make a kid who did not have previous conduct problems steal and run away from home. Despite my criticisms, Inside Out is easily one of my three favorite Pixar movies of all time, along with Wall-E and Ratatouille. I can even envision it being useful in therapy. Asking a child to think about a situation and consider what Joy would say versus what Sadness or Fear would say about it might help make cognitive-behavior therapy more engaging and fun. If you're a child therapist/psychologist/psychiatrist and haven't seen it yet, what are you waiting for? It's the only Pixar movie where I'm eagerly anticipating a sequel, given the portents at the end about Riley turning 12. I'd love to see what Pixar does with the even more tangled emotions and relationships of adolescence.